Most of the time, we hear about how corporate companies having all those employee benefits and enjoying certain perks and now we have Rewardz! Founded by Nicole Seah, Himanshu Chaudhari and Jaya Maru, Rewardz now collaborates with over 100 partners in Singapore providing employees of companies who uses their service, additional perks of enjoying the best corporate rates on lifestyle essentials! 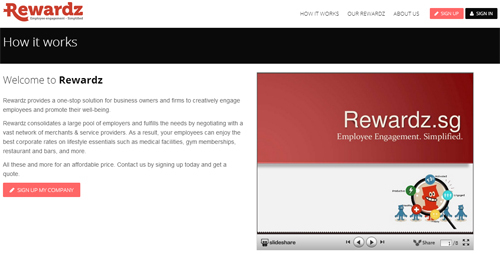 A Brief Introduction: Rewardz provides a one-stop solution for business owners and firms to creatively engage employees and promote their well-being. We contacted one of the Founders, Ms Nicole Seah and one of their Pioneer Employee, Mr Andrew Fam to take a peek at the initial stage of Rewardz. 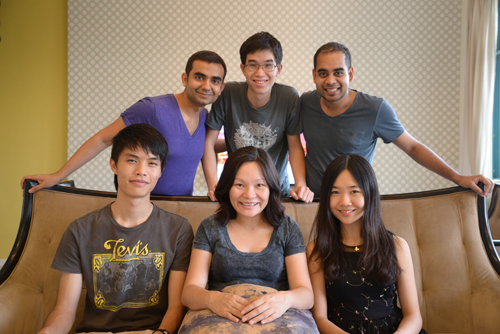 We were lucky enough that the core team and business idea came up amongst close friends. From there on, it was a no-brainer – we love working with each other and have different backgrounds/strengths. Two of us quit their jobs and went into Rewardz full time, while the rest pooled in the initial capital to start with. 2) What were your initial plans for these pioneer employees when they first joined you? How does the execution differ from your initial plans, and in what ways? Our first 2 employees joined us in March – one each for tech/business partnerships and sales & marketing. Both employees came through our network and friends’ circle – this was important to us as these roles are very critical. One key learning point has been to hire people based on their career expectation – for some employees, sweat equity is an important motivation, for others, flexibility of working in a start-up environment is important and so on… So for the next round of hiring, we would definitely focus a bit more on what the employee is expecting out of this job and how closely we can match it to our requirements. It may sound very generic, but alignment of expectations is more important than salary, equity and other factors. a. How well does the core team work with each other? This includes respect and trust in each other. The risks are very high, hence team members and co-founders must have each other’s back. Hence, either by forming a core team with people you know or spend enough time during the hiring process with the potential partner/employee to be sure of how they will fit into the team. b. How well do team members complement each other? Also, too many cooks spoil the broth. So team members must play to each other’s strengths and avoid getting in every domain. So for example, if you already have an experienced web developer and you are looking to expand your tech team, do not hire another strong web developer. Perhaps hire someone with mobile app experience (if required), or hire a budding developer who is willing to learn from the other person. Having said that, creative differences are welcome in a start-up and play an important role. But diversify the strengths and skills of people to get the most out of the team. I joined a startup as a stepping stone to running a social enterprise in a third world country. Through this phase, I wanted to learn about the different aspects of running a business, from product management to business development. 2) Being one of the pioneer team members, what are the kinds of initial challenges faced? Some of the challenges I faced are being comfortable with the ambiguity, learning to motivate and discipline yourself. My role is always expanding as the needs have changed. I’m currently doing product development for our mobile app. 4) Challenges are inevitable in a startup environment. Prior to join Rewardz, are you ready for these challenges? Or did you know what you might have to face? Yes I’ve interned in a startup prior to Rewardz and TaskAmigo. 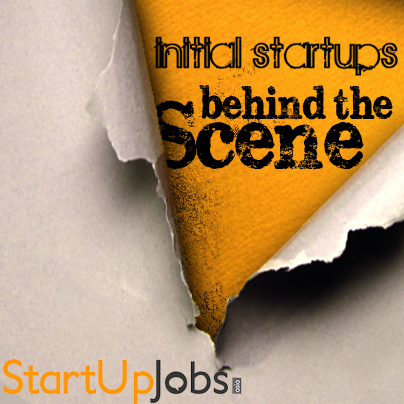 Startup Jobs Asia’s next interview will be revealed next weekend! Stay tuned!